Owen has written three critically-acclaimed novels, a collection of short stories, and a dozen screenplays for Hollywood studios. His novel The Book of Harold was optioned by Warner Bros. Television and his most recent novel, Everyone Says That at the End of the World, was in the running for the Thurber Prize in American Humor. He’s been voted Austin’s favorite writer seven times by the readers of the Austin Chronicle. He’s taught writing at Texas State University, St. Edward’s University, and in the MFA program at Roosevelt University, and has written for Salon, the Huffington Post, and the Austin Chronicle. He’s the creator and host of the One Page Salon, called “the best reading series in Austin” by the Austin American-Statesman. Jodi has a Ph.D. in English from the University of Texas at Austin, and offers workshops, editing, writing, and mentoring services as Write Good Consulting. She’s a wordslinger with Typewriter Rodeo, a team of writers who craft spontaneous poetry on vintage typewriters. They’ve typed poems at the Smithsonian, the Boston Book Fair, the Dallas Museum of Art, the Nantucket Book Festival (including for poet laureate Billy Collins), and at Willie Nelson’s SXSW music fest at his ranch in Luck, Texas. You’ll hear her producing poems on her 1970 Litton Imperial on Typewriter Rodeo’s weekly Texas Standard segment on Austin’s NPR station KUT 90.5. Jodi and Owen have conducted workshops on creativity, writing, communication, and team building for the Writers’ League of Texas, the University of Texas McCombs School of Business, LBJ School of Public Affairs, and NOVA program, the National Multiple Sclerosis Society, Acton MBA, Dell, and 3M. 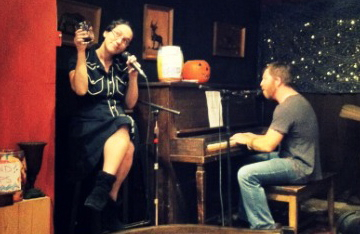 Jodi and Owen also work as performers, and can be found on stages around Austin entertaining audiences at such events as Master Pancake at the Alamo Drafthouse, Literary Death Match, The Dionysium, The Story Department, and The Encyclopedia Project. They also host fundraisers and emcee auctions for schools and non-profit organizations. And they’ll occasionally officiate a wedding. They’re known for their energy, enthusiasm, and sharp wit, and their ability to keep an audience engaged, inspired, and laughing.